Multifunction actuator for DIN rail (2 units) with 2 outputs (16A C-load) which offers multiple configurations as shutter channels and individual outputs. It allows manual control of its outputs thanks to the push buttons on the cover and includes a logical function module. 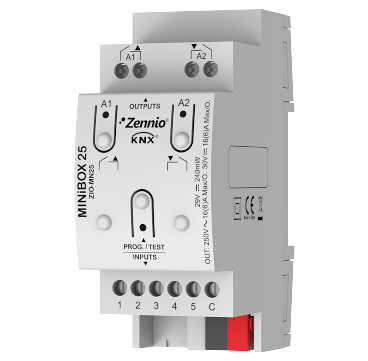 MINiBOX 25 also incorporates 5 analog-digital inputs that may be configured as binary inputs for sensors and potential-free push buttons, as temperature probe inputs or as motion sensor inputs, as well as four room thermostats to control heating/cooling systems.